We’d love to have you come visit us! The Mineral and Lapidary Museum of Henderson County was founded with the goal of providing a place where people could discover and learn about the beauty and diversity of the world beneath our feet. The museum currently features a mix of exhibits that range from specimens of raw minerals in their natural state to polished gemstones and other finished material. 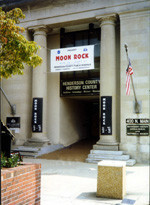 The museum also hosts special exhibits of collections on loan. Among the popular highlights of the exhibits are the displays of minerals found in Henderson County and in the state of North Carolina — which has one of the nation’s most diverse mineral deposits, the exhibit on the Hendersonville meteorite, and the fluorescent mineral display. Also popular, especially with youngsters, are the museum’s displays of fossils which are highlighted by a casting of a tyrannosaurus rex skull, a mastodon tusk and teeth, and a wooly mammoth leg bone. Visitors to the museum will quickly discover that there is more under our feet than dirt and that there is much more to rocks than most suspect. The Mineral Museum is a 501(c)(3) non-profit and is volunteer run. The Mineral and Lapidary Museum of Henderson County is open six days a week, except for the months of January and February. The Museum will be open from 1 to 5 p.m. on Martin Luther King Day. The Museum is closed on Christmas Eve, Christmas Day and Thanksgiving Day but open on Memorial Day, Labor Day and 4th of July. During the Apple Festival over the Labor Day weekend, the museum has extended hours. We will be open 10 a.m. to 6 p.m. Fri-Sun & 10 a.m. to 2 p.m. on Mon. Schools, Scouts, Seniors, other organizations and/or tour groups exceeding 15 persons should make arrangements to come in between 9 A.M. to Noon, Monday through Friday. Please call 828-698-1977 to schedule your tour. The museum gift shop offers a varied selection of jewelry — bracelets, earrings, pendants, necklaces — all hand crafted. Also available: Minerals, fossils, tumbled stones, and posters of fossils, minerals, and dinosaurs. We have all kinds of specimens from all over the world for sale. Proceeds from gift shop sales help us keep the museum admission free.